"I have always been a builder and experimenter. 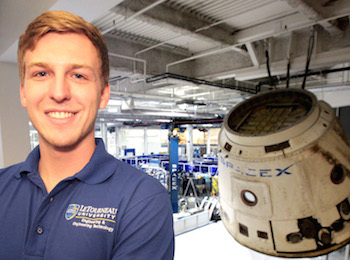 LeTourneau University's mechanical engineering gave me the ultimate set of knowledge and skills that enable me to build and experiment with as much of the world as possible. One of the highest points of my career with SpaceX was the first time we launched a rocket that I had been inside and helped put together. It's amazing to know the work I had done in the previous months were pieces of the puzzle that ended up with a satellite high above the earth in orbit." Design products that affect virtually every area of your life. Automobiles, gas turbines, robots, hydraulic systems, and so much more.